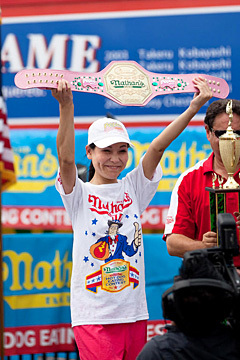 Korean-American Sonya Thomas won the Nathan's Hot Dog Eating Contest for Women in Coney Island, New York on Monday. The 43-year-old ate 40 hot dogs in 10 minutes, 11 more than runner-up Juliet Lee of Chinese descent. The event, which is held every July 4 to commemorate Independence Day, is now in its 39th year. The competition was divided into men's and women's categories for the first time this year. In the previous edition, Thomas, 165 cm tall and weighing 48 kg, ranked fourth overall and No. 1 among the female contestants after consuming 36 hot dogs. Meanwhile, in the men's category, Joey Chestnut, nicknamed "Jaws," held on to the top spot this year by finishing 62 hot dogs, for the fifth year running. The winners of the competition each took home US$10,000. Dubbed "The Black Widow," Thomas was born under the name Lee Sun-kyung in Gunsan, North Jeolla Province. She immigrated to the U.S. in 1997. Tomas has swept more than 60 eating competitions since she began competing in 2003, including last year's chicken-wing eating contest, where she ate 181 wings in 12 minutes. She currently works as a manager at a Burger King outlet in Alexandria, Virginia.